We assume that native microservice is named sampleNative. 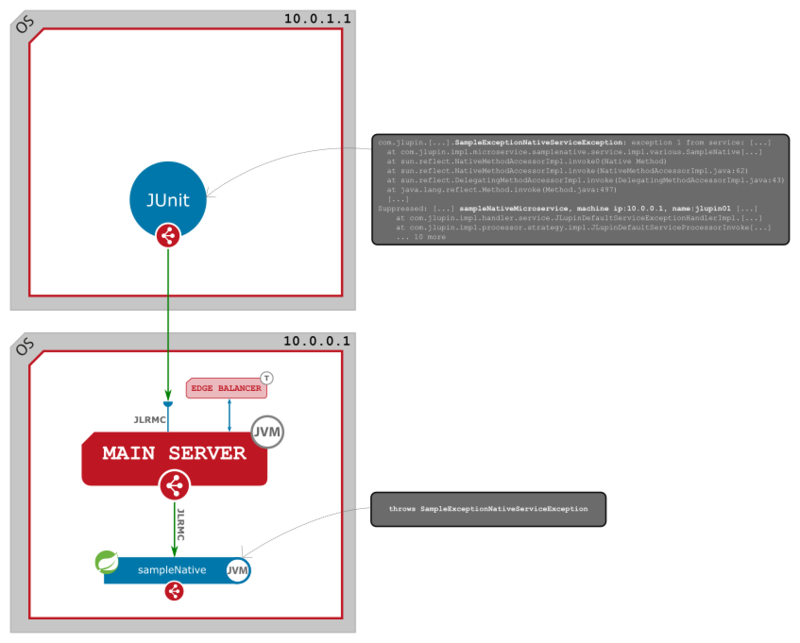 Below image shows environment configuration and how the request is passed. This service is located inside sampleNative. Because of that above exception (in serialized form) is not send to the client's side, Jlupin's classes which are calling remote objects detect it and throw exception of type RuntimeException (JLupinCommandException). It contains all relevant information about what and where happened (including IP and name of the machine). is served to client in clear and readable form. Sections [exception handler message begin] and [exception handler message end] are served by exception handler on given microservice to make exceptions which went through many microservices readable. We will see it on the other example. 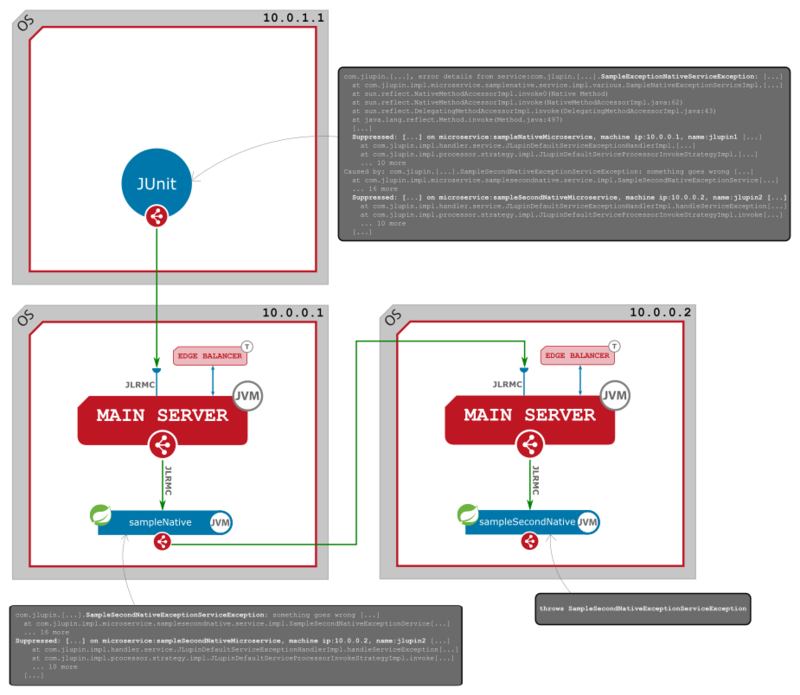 Below image shows environment configuration and how the request is passed. This service is located inside sampleNative. It will call microservice sampleSecondMicroservice. is a remote reference to service which is located on sampleSecondNative. This service is located inside sampleSecondNative. Above method packs exception SampleSecondNativeExceptionServiceException into exception SampleExceptionNativeServiceException. It is correctly serialized to byte array form on sampleNative's exception handler's side due to fact that it has all required classes: SampleSecondNativeExceptionServiceException, SampleExceptionNativeServiceException on it's own side. Possibility of hiding error by Spring Boot as a client - how to handle it? Spring Boot without configured exception handler is not showing full stack trace in output message (security reasons). Without configured exception handler on Spring Boot's side we had received only the result of executing method Throwable.getMessage() by Spring Boot and there is only highest error message without details which are in full stack trace. The solution is to use Exception Handler and correct handling of exceptions on Spring Boot's side with showing information which are appropriate for application and user. Exception Handler's documentation for Spring Boot can be found here and here.